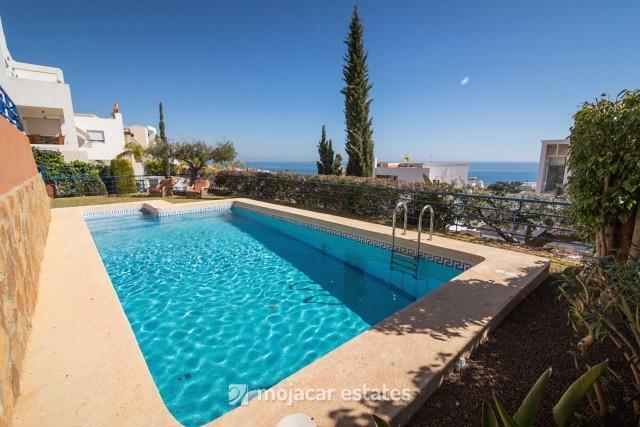 This is a stunning villa with amazing sea views from all the rooms for sale on the Marina de la Torre golf course in Mojacar, Almeria, Andalucia. 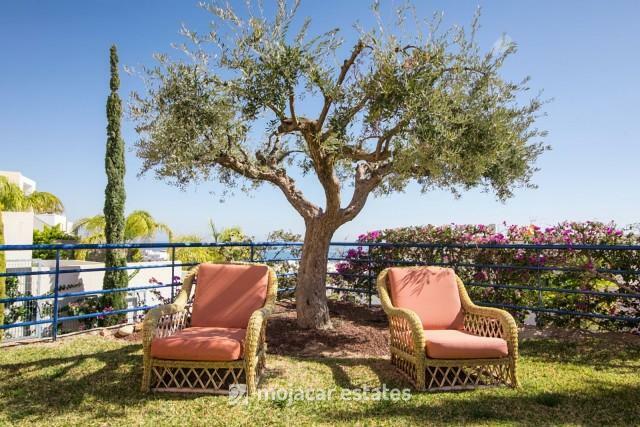 La Grana Home has been immaculately decorated to the highest standards ready to be a holiday home or a boutique hotel. 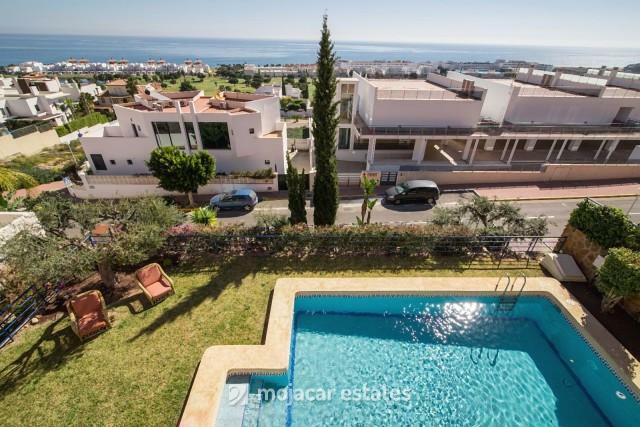 The villa stands on a plot of 993 m2 over 3 floors with different terraces and a pool and landscaped gardens all facing the sea, and forms part of the Marina de la Torre golf resort. 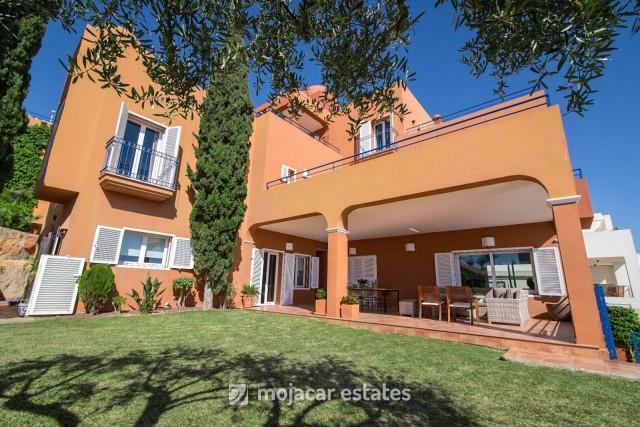 The villa´s main entrance is on the top floor via steps to the front door from the parking area and garage. There is an electric gate that opens from the street and leads into a large parking area, big enough to park several cars and also to the large double garage. This area is right at the top end of the plot and house. A few steps then take you down to a large tiled porch and the front door. 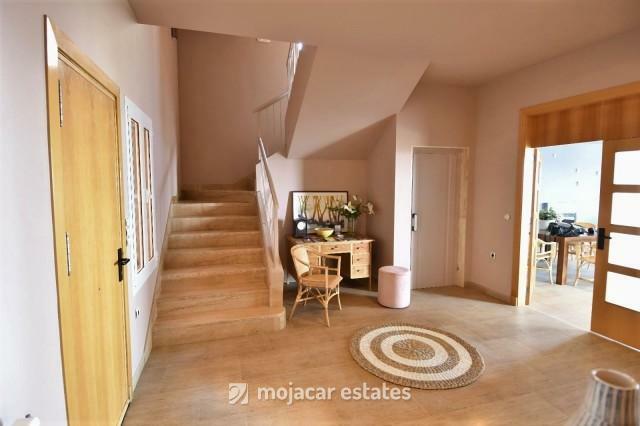 Coming into the hall, you have the stairs, the lift, a door leading from the garage directly into the house and to the right a spacious double bedroom with en suite bathroom with walk in shower. 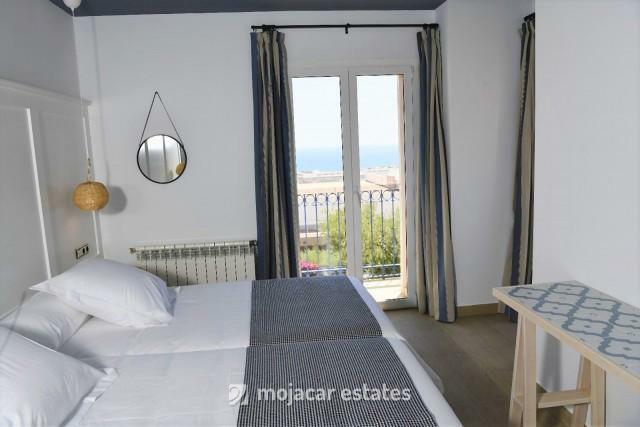 The bedroom has fitted wardrobes, its own private terrace with beautiful sea views and a Juliet balcony. Going down one level, to the first floor, you have the master bedroom. 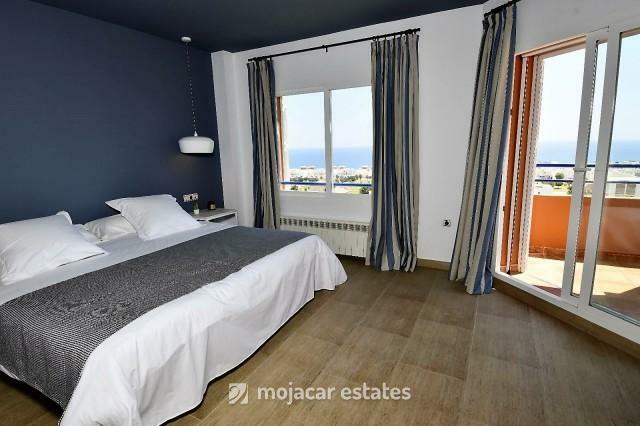 From the comfort of your bed you can look at the wonderful sea views. 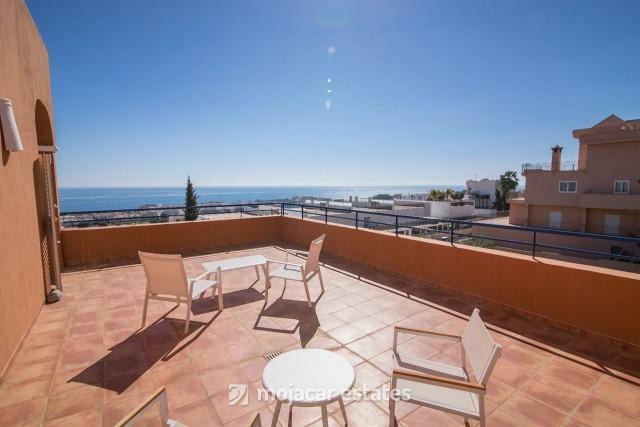 You have a terrace that is shared with one of the other bedrooms and gets all day sun. The dressing room has a window and has been fitted with bespoke carpentry wardrobes lining both walls with plenty of space. 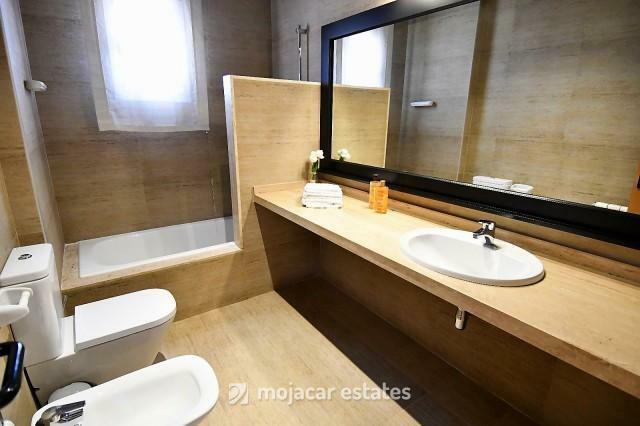 The en suite bathroom has double basins, a bath and a walk in shower plus a separate WC. 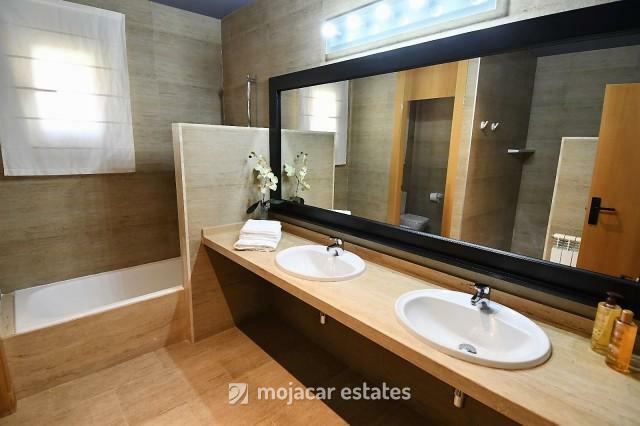 On this level there are 2 other double bedrooms both with en suite bathrooms with bath tubs. 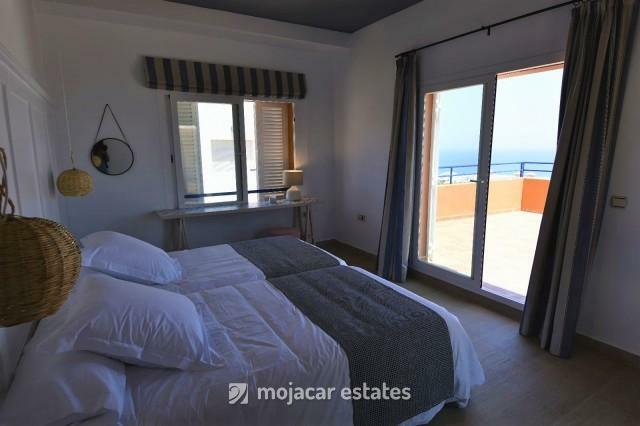 One of the bedrooms has windows with access to the shared terrace with the master bedroom and the other has a Juliet balcony, however, both bedrooms again have fabulous sea views. These two bedrooms give onto a spacious sitting room with a double height ceiling and windows with views of the back of the house and the impressive rock at the entrance. There is a sofa bed for extra accomodation here. 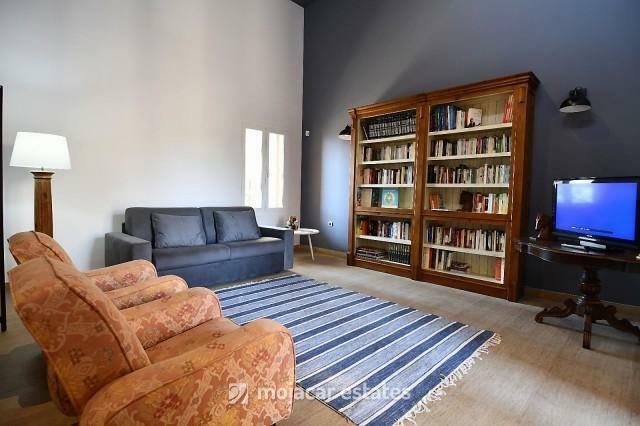 This is a second sitting room / play room / TV room / library / office, a space that can be used in many different capacities. Going down one more flight of stairs you come to the ground floor. There is a grand entrance hall with the staircase and the lift on one side and doors to the sitting room, the kitchen and the guest cloakroom. The kitchen is fully fitted and equipped with a window looking out onto the garden. There is a utility room off the kitchen with plenty more cupboard space and washing machine, plus a window and door to the garden and a patio. There is also a walk in pantry with shelves lining the walls from floor to ceiling and another door into the wine cellar and store room which also boast windows for natural light. 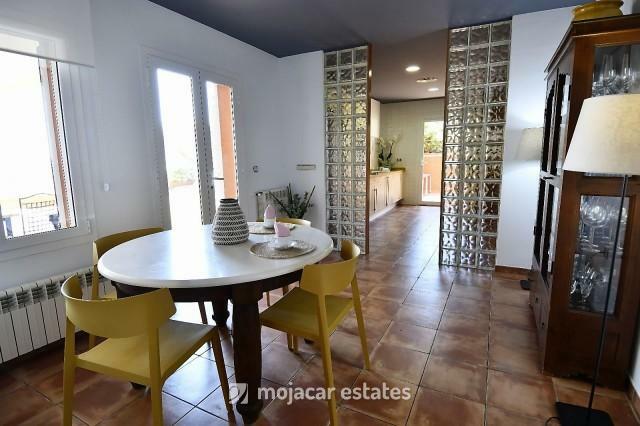 There is also a large dining table in the kitchen so you have the option of dining in the kitchen or more formally in the dining area of the sitting room. From the kitchen there are doors out to the large south facing veranda with plenty of space for table and sofas, and to the lawn and garden. Here there is all day sun. The large open plan sitting – dining room measures 72m2, and has windows on 3 sides, all with stunning views of the seascape. There is a wood burning stove for extra warmth in the winter. The entrance through the front door on the ground floor is opposite a very impressive piece of rock upon which the house is built. 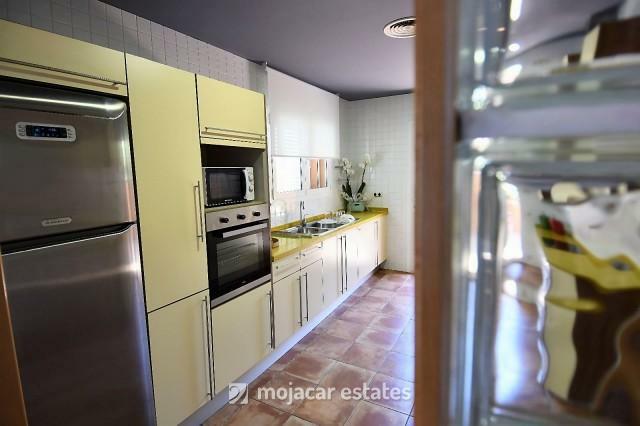 There is also a semi – basement of 70m2 with a complete bathroom with walk in shower. The basement has its own independent access and has high windows for natural light that look out to the garden and pool area. 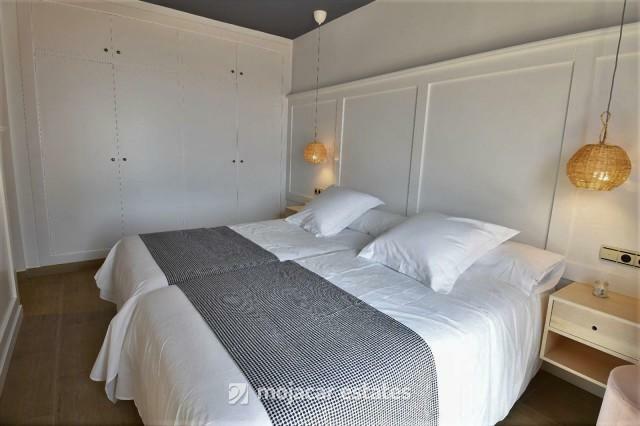 At present this is a large studio room that can easily be converted into a family bedroom or studio apartment. The pool is just below the veranda and is surrounded by a green lawn and trees. From the pool there are steps down to a gate accessing the lower road. The villa has two entrances and two front doors, one with access from the lower road and the other with access from the upper road. All the windows are made from very good quality aluminium carpentry and are double glazed. 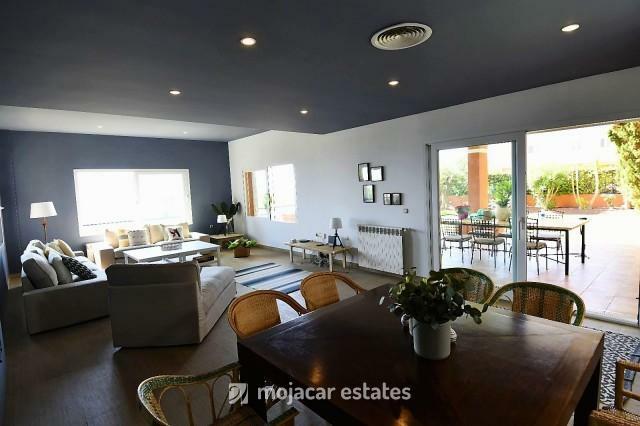 The house is really well insulated and there is central heating (oil) and air conditioning / heating that can be regulated in each of the rooms individually. The house has just had a complete refurbishment with new bathrooms, floors and furniture. The curtains are to hotel standard (fire proof). Fitted wardrobes in all bedrooms. 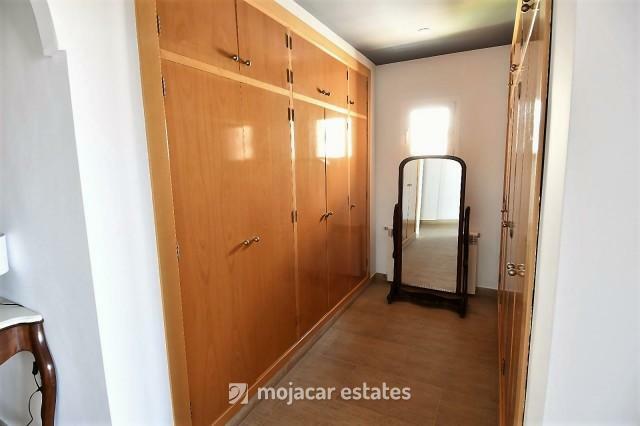 There are plans for the double garage to be converted into another bedroom and bathroom should the purchaser be interested in taking on this project. This villa has been designed and is ready to be a beautiful home or holiday villa or to be continued as a business as a boutique hotel. 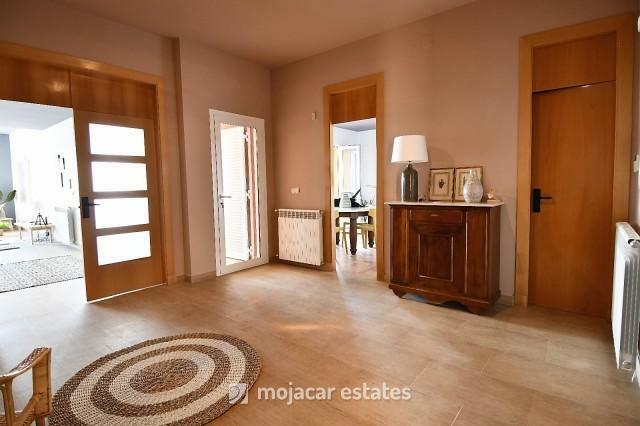 There are various options in the use that this property can provide. 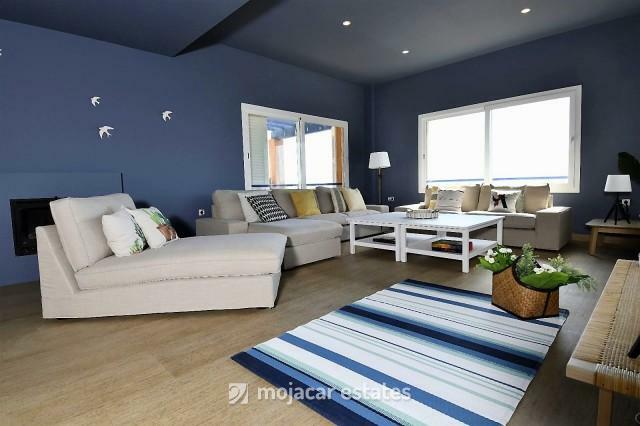 On the above Google map click on enlarge map and the exact location of the property for sale on Mojacar Playa, Costa Almeria , Andalusia, Spain is marked with the blue pin. 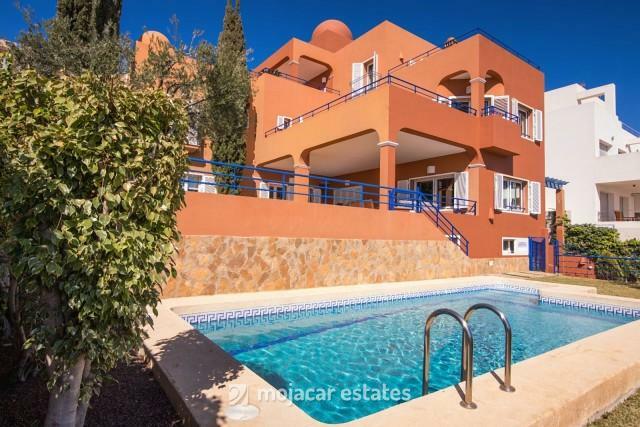 It is located in Marina de la Torre Golf Resort, at the north end of Mojacar Playa, 1km away form the fishing village of Garrucha.